Concrete as an indoor flooring material is a relatively modern option. It is an eco-friendly, fairly inexpensive flooring choice that is versatile and highly functional. Adding a color or stencil gives concrete a more aesthetically appealing look and may be made to resemble marble, river rock or wood. This diversity is ideal for just about any decorating style. Concrete is a material with both positive and negative aspects for homeowners to consider prior to construction. Concrete is among the hardest materials in the construction world, which makes it among the most durable. As long as it is laid and cured properly, it is highly scratch resistant, an ideal characteristic for flooring. The floors are long lasting, and as long as they are cleaned and cared for properly, they almost never need replacement. Concrete is widely available at home improvement and similar retail outlets, making it easily attainable and often less expensive than stone or tile alternatives. Concrete floors are highly recommended by the American Lung Association for people with allergies and asthma. It is especially helpful at preventing buildup of animal dander, dust and dust mites. These allergens live deep in a carpet's matting, making removing them from the home difficult even with a vacuum. Concrete does not present this problem and may be swept, vacuumed or mopped as needed. 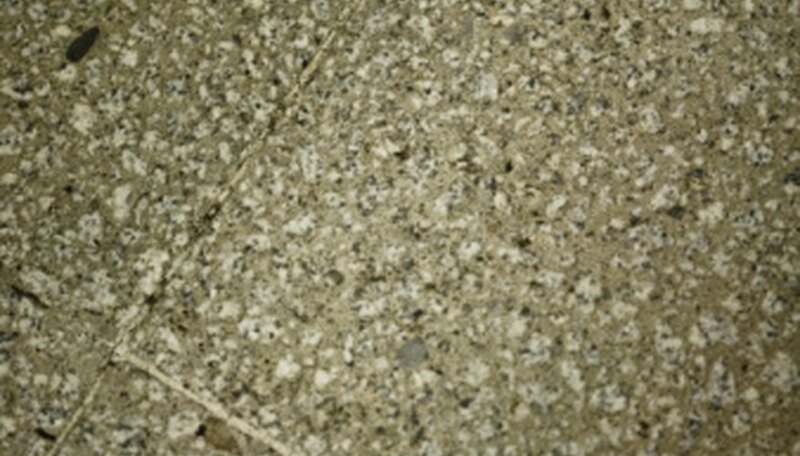 Standard concrete, made by mixing Portland cement with sand, gravel and water, is not an eco-friendly material because of its use of fossil fuels for manufacturing. For greener options, homeowners can find more modern mixtures, which replace Portland cement with fly ash, a byproduct of coal burning, or varieties that use blast furnace slag, a byproduct of iron manufacturing. Both of these mixtures produce durable products with a lower environmental cost. Like standard concrete, these products are widely available at nationwide retailers and home improvement stores. Concrete countertops require just a few materials, and for that reason are less costly than granite, marble and sometimes even tile. Though the low cost may be tempting, homeowners should consider the highly specialized labor involved in the installation process. If installed incorrectly, concrete may be obviously uneven and, ultimately, won’t settle properly, which may result in a more easily damaged floor or one that cracks. Concrete floors may be installed on a do-it-yourself basis to save money, but pay careful attention to directions, specifically those on mixing and curing techniques. The negative aspects of concrete flooring are due more to the polishing itself than the concrete. Adding a polish to the floor makes it more slippery, which may lead to more falls and injuries. Because of its rigid nature, concrete tends to shatter or break any dropped objects and may cause some foot fatigue after standing for long periods. Some homeowners complain that concrete’s natural temperature retention makes it colder to step on throughout the year, but this is easily solved by adding a few area rugs. Occasionally, temperature fluctuations may cause cracks in a concrete floor. As with outdoor applications, concrete will grow and shrink during different times of the year. These changes, even if they’re subtle, may cause minor cracks to the concrete’s surface. With a polished or otherwise decorated concrete floor, these cracks may go unnoticed and in some instances may give a bit of character to the room. For those situations where the cracks are too big to ignore or just not liked, a few simple fixes may be applied. A waterproof sealant or resin may be applied to seal the crack and prevent it from becoming worse. Additionally, a cement overlay, a thin layer of cement, may be applied over the top of cracks to make them invisible. Though easy and effective, reproducing the color and texture may be a chore.